The company Empreza Insulana de Navegacao, or also named Insular Line, dated back to 1871 when they were formed for regular lineservices between Lisbon in Portugal to the islands of the Azores and Madeira, including Cape Verde. The company was following the former Empreza Lizitana, who withdraw from the service a little before. From 1885 to 1910, the company also had a scedule between Lisbon, the Azores and the USA. To improve the service, in the late 1950's the company decided to built a new ship for the original route and although it was hoped she could be built in Portugal, she was eventually created at the other side of the European continent. Below, Funchal is seen passing the Velsen ferry on her way to the North Sea at the 18th of may 2014. The new ships name was to be Funchal and she was the largest ship that was ever built at the wharf who got the contract, the Helsingör Skibsvaerft og Maskinbyg at Helsingör, Denmark and she was also the largest ship built in Denmark after the second worldwar. Her tonnage-measurement was 9824 and the ship had a lenght of 153,51 meters, a width of 19,05 meters and a draught of 6,38 meters. She was driven by two propellers, powered by two Parson's design steam turbines and although she managed to recieve a speed of 23 knots during her trials, her normal servicespeed was going to be 20 knots. Her passenger capacity was 400, divided in three classes. In first class there was space for 80 passengers, in Tourist A-class there was space for 156 and 164 passengers could be sailing in Tourist B-class. The ship was sailing under the Portugese flag with her homeport being Madeira. Her keel was laid in july of 1960 and she was built to a very high standard, as usual for a ship built in Denmark. This also was one of the reasons that she was sailing for such a long time. Funchal was launched at the 10th of february of 1961 and arrived at Lisbon for the first time at the 19th of october of the same year. Although she was built in Denmark, the overall designer of the ship was a Portugese named Rogério d'Oliveira. Her created a long ship in comparissement with her width, making her look larger then she actually is. Her hull was made of steel and rivited, her upperworks were welded aluminium. Being lighter at her topdecks, she gained more stability. To stabilize her even more, the ship was equipped with Denny Brown stabilizers. The ship had, and that is normal for a ship in her class, three cargo holds that could hold a reasonable amount of cargo, two forward holds and one aft. The ship mostly carried cars, fruit, mail and general cargo. Also, four of her holds were refridgerated. All her public rooms were located on the promenade deck and they include a first class lounge, reading and card rooms on the forward section of the deck. Astern were the tourist A class lounge and the smoke room. The first class dining room was on the forward A deck and the galley and tourist class dining room were astern. The tourist B lounge was still further astern on the same deck. The first class cabins all had private bathing fascilities, but the tourist A and tourist B class passengers had shared bathrooms. Overal decor was enriched with lavish woodworks, rosewood in the main lounge, teak in the smokeroom and oak panelling in the first-class dining room. A magnificent spiral staircase made of rosewood, glass and metal was he centerpiece of the entrance lobby. The tourist class diningroom was divided in two parts, 160 seats for Touris A at the portside and 160 seats for Tourist B at the starboard side. The cabins were also very attractive. First class cabins were all having private facilities and were designed as single, two- of three-berth. There were also four double-bedded suites. The Tourist A-class cabins were also single, two- of three-berth cabins, but those had to share bathrooms between two cabins. Tourist B-class cabins were two- to six berths and used communal bathrooms. The whole of the ship was aircontidioned, nowadays normal but in the early 1960's this meant luxury, especially in the warmer climate around the Azores. Below, Funchal is seen in the summer of 2003 close to Buitenhuizen when sailing the Northsea Canal. She is still pictured in her former shape, with the two large deckcranes in front of the bridge that had been installed to lower tenders from 1990 onwards. Those were later removed when she was rebuilt for Portuscale. The new Funchal was going to sail on the route between Lisbon, Madeira and St. Michaels Island. Her first voyage as such started at the 4th of november 1961 from her homeport Lisbon. She was also used on several other routes, mainly around the Azores and winter cruising. Throughout the 1960's her main role was that of a miniliner, but at the end of the decade airtraffic started to take over these services and Funchal was more-over used as a cruiseliner. In february of 1968, Funchal had to honour to be selected as the presidential yaught for a voyage to Brazil to commemorate the 150th anniversary of the Brazilian independence from Portugal. She was also carri-ing the urn with the ashes of the first emperor of Brazil, the Portugese king Pedro. The voyage, with President Thomas aboard, took her from Lisbon via the Azores, Madeira, Cape Verde and Guiney to Rio de Janeiro but underway she suffered severe problems with her boilers. It delayed her arrival, although she arrived just in time for the celebrations and had to be furthermore repaired when she was in port. In october and november of 1969, she also sailed several cruises to the Azores and Madeira from the British port of Southampton. During these cruises, there again had been several problems with her boilers and that was one of the main reasons that the ship was about to be rebuilt into a motorliner, as well as recieve updates because her future clearly was now in cruising. With her three passengerclasses and limited bathroom facilities, this would be difficult to achieve otherwise. In 1972, the ship was rebuild at the Nederlandse Scheepsbouw Maatschappij in Amsterdam to a one class cruiseship because of this. Luckily, not much was altered to her exteriour profile, only a small extra deck was added in front of the funnel and her aft superstructure was extended a little. Of course her passenger-accomodations were updated so she now was able to sail as a one-class cruiseliner. But the main reason for her modernization of course was her engine. In Amsterdam, her former boilers and steam-turbines were removed and replaced with 9-cyliner diesel engines of Werkspoor design. Her new machinery did not make her faster, as she achieved just 18 knots at her trials and her servicespeed was going to be around 16 knots. That said, speed was no longer required as a cruiseliner as now her days as a liner were over. The new tonnage-measurement for the ship was 9563 and her passengercapacity changed to 465 in one-class. Her decks were now named from top to keel Navigators, Promenade, Azores, Madeira, Algarve and Estoril. As ship for Portuscale, Funchal had her two distinctive forward cranes removed as mentioned before. In june of 1972, the ship was handed back to her owners and sailed cruises from Dover and Zeebrugge to the Azores, Cape Verde and Madeira. The following winter, the ship headed back to Brazil for a series of South American cruises out of Rio de Janeiro. She still did well, but her owners, Empresa Insulana, did not. They had run into financial problems, mostly due to the changes that had to be made from liner-operations into cruising. To solve the problem, the company merged with another Portugese line, the Compania Colonial, into Compania Portugesa de Transportes Maritimos in february of 1974. In her new cruising role the Funchal had already been painted white overall instead of having a dark hull, but now also her fiunnelcolours changed from the traditional yellow with a black top to the new yellow with green and white bands. In 1976, she was chartered by the Greek shipping tycoon George Potamianos, who'se family had been the founders of the great Epirotiki Steamship Company in 1850. Within ten years, in 1985, he was able to buy her as the Compania Portugesa de Transportes Maritimos was declared bankrupt. Clearly, he admired the Funchal and together with the Fritidskryss family from Sweden he placed her into the Great Warwick Inc. brand, based in Panama. This also meant that the ship was now losing her Portugese registry, although her officers stayed Portugese, mixed now with Swedes. The management was placed in the hands of Potamianos' Arcalia Shipping Company but she was going to sail under the banner of Classic International Cruises, a newly created brand. Her funnelcolours stayed yellow, but now recieved a black top again and a thick light-blue band in the middle. Her new scedule of cruises was European in summer, based in Harwich, England and South American in winter, based in Rio de Janeiro. To make it possible for her to anchor in more ports, in a refit in 1989/1990 the ship was given two large deckcranes to lower two newly installed tenders. It gave her a very distinctive look. In 1996, the Swedish Fritidskryss family pulled out of the brand, so ownership was now only under the Potamianos name. The company itself had grown with more classic cruiseliners and mostly, they were kept in pristine condition. To make her up for the 1997 SOLAS (Safety Of Lives At Sea) regulations, most of her interiours had to be rebuilt and her classic woodfittings removed and replaced by veneer lookalikes. 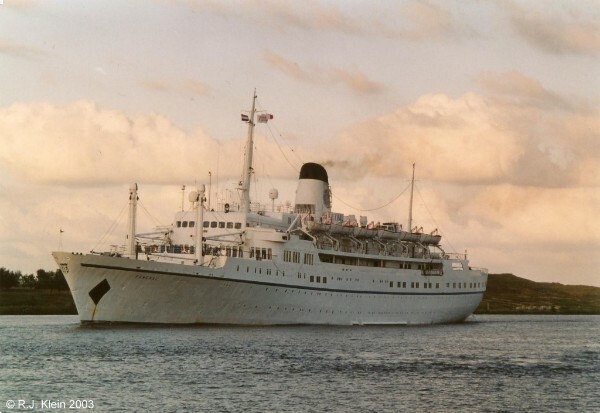 She also recieved the new livery of Classic International Cruises, the all white funnel with the image of a caravelle. From 2004, she was also seen in Australia and her seasons there were very popular. In 2010, to update her again for the new SOLAS regulations, Funchal was headed for the Navalrocha Shipyards at Lisbon to be updated extensively. Sadly, at the 29th of may 2012, George Potamianos died during the time of her long rebuilding and subsequently the company came in severe financial difficulties. All ships of the line have been arrested in port during september and october 2012 and the company seems to be unable to pay outstanding wages for crew, as well as the 6 million dollars that are still needed for the finishing of the rebuilding of Funchal. It seemed that nobody was able to pay for her lenghty rebuilding and that the only way for the great ship was sailing off to the beaches of India. To everyone's surprise, a Portugese named Rui Alegre bought all former Classic International liners in the beginning of 2013 and stated that he would bring all of them back to service under the new venture of Portuscale Cruises. It first seemed a little far-fetched, but the rebuilding of Funchal at the Navalrocha shipyards at Lisbon did take place and she emerged as a very fresh looking liner with a black hull (as originally built) and a yellow funnel sporting the 'P' of Portuscale Cruises. Also her interiours have been completely updated. Her rebuilding, costing around 10 million euro has been extensive, but she did not loose her classic profile. In fact, Funchal is now a 4-star plus luxury liner, and is even update far and above the new official requirement, making sure she will be around for a while when she will stay as popular as she is now. The ship was re-inaugurated in presence of the Portugese prime-minister Passos-Coelho at the 1st of august and she left the shipyard for the Lisbon cruise terminal. From there, she was due to sail her first cruise starting the 6th of august. Sadly, becasue she still had to wait for official certification, this had to be postponed to the 15th when she departed for sea trials. Paperwork worked slowly and when all was finally signed, she immidiately left at the 27th of august for Gotheborg, Sweden, where her original first cruise was heading for. Below, Funchal is seen in her new colours of Portuscale Cruises when she visited IJmuiden for the first time as such atr the 9th of may 2014. Arriving in Gotheborg for a cruise through the Norwegian Fjords, the ship was again inspected, which is normal for a ship sailing the Fjords, as this is a very delicate and important part of Norwegian tourism and culture. Although she had been updated and modernized, she did not pass. Her safety equipment was not internationally approved and it seemed that her watertight doors did not close totally. Fire protection was not on order and computersystems were not working as they should. Next to this, the training of staff aboard for safety wasn't adequate enough and the ship was declared completely unsafe to sail. With 360 passengers aboard, the ship had to wait untill all was fixed by workers that were quickly flown in from Portugal. Finally, the ship was allowed to sail and declared safe at the 2nd of september (still 2013, that is). Most other ships of the line also have problems being rebuilt and it seemed that Portuscale Cruises had a very difficult start, but do not forget that rebuilding a bunch of liners of 50 years old is something different then building new sailing shoppingmalls from Florida. Sadly, in july of 2015, all cruises with Funchal under the flag of Portuscale Cruises were cancelled and their website went black. Funchal at the time was the only ship sailing under the banner of the company, with Azores being chartered to CMV Cruises. So also Portuscale Cruises met a premature end and, after a lenghty lay-up in Lisbon, she was finaly sold in december of 2018 as a hotelship in the center of London under ownership of the Signature Living chain of hotels. More details about her next life have yet to be announced.